Posted by rawkfistmusic in 2009, Red. Red is quickly becoming a phenomenon, one in which I have had no problem being a part of. 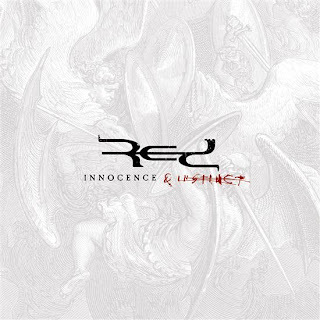 In a move reminiscent of Trent Reznor’s mind-numbing prerelease games for Nine Inch Nails’ Year Zero, the sophomore effort of Red was built up with a number of twisting and turning internet puzzles. For months, diehard fans of an increasingly popular band slaved over the tiniest numbers or messages, all just to find out a little bit more about Innocence and Instinct. Maybe they’re all just crazy, but after Red’s stellar 2006 debut End of Silence, can you really blame them? It’s worth mentioning that Red is unlike anything you’ve heard before, a pure hard rock band with glorious electronic showerings and powerful vocals that range from beautiful melody to emotional screams. It won’t take long for you to realize just what you’ve been missing if you aren’t already a member of Red nation, because “Fight Inside” kicks out your speakers after one of the band’s signature electronic intros. The guitars kick in shortly after to compliment the backbeat, and by the time you hear the crisp vocals, you’ll be sold on Red’s style. “Fight Inside” is hardly Red’s catchiest track, but it’s powerful both in sound and message, and if you don’t figure out that Red’s a Christian band right away, you’re not alone. It’s increasingly harder to avoid going on with great length about each song, largely because every song brings it’s own unique traits, breaking free of perhaps the only weakness of Red’s debut. Even a cover of Duran Duran’s “Ordinary World” shakes off any kind of mold that Red may have used to make Innocence and Instinct, and it’s certainly easy to notice throughout that not a single song is the same. On my first listen I was barely focused on the CD at all, but managed to notice every time a song changed. It’s very hard to find an album like that at any time. From the harmonies of “Shadows” to the gritty “Out From Under”, not one track falls far below the rest. It’s very damn hard to find a flaw in Red’s second effort. The production is out of this world, the instrumentation is not legendary, but more than fits the sound of the band, and the lyrics are masterful. This isn’t a blatant Christian record, you’d never know Red was one of those bands without serious thought. The biggest flaw has to be that Innocence and Instinct has only 10 tracks, but picking up the deluxe edition will fix that problem, and even without spending money, this disc never feels shortened or incomplete. Quite simply, it’s everything that manic fanbase could have hoped for and more, which pleases this crazy fan quite a bit. The Point – Innocence and Instinct is brilliant in every way, with virtually no flaws. The powerful emotion of the record is top notch, and the band has more than enough chops to pull it off. If Red isn’t established as one of the top bands in their genre after this record, there is no justice in this world. Buy this record. Nice! that is very impressive of Red, (and you, good job!). I just might have to buy this one. hmm…. A 10/10? I mean, I’m impressed with the Innocence & Instinct LP, but it falls short. At least, it’s got what it learned from their last LP, End of Silence. It’s still impressive, though, kid you not! Great rock album. Didn’t even know they were a christian band. One of my favorite albums for 2009.